Music legend Jagger, 68, said the president did "very well" when bluesman Buddy Guy successfully persuaded him to join in on a few lines of Sweet Home Chicago, the blues anthem of the president's home town, during an East Room concert earlier in the week. "I thought he was courageous, because there was some element of reluctance," Jagger said, adding that "it was a hard moment for the president to get out of". In an AP interview, Jagger also said he was pleased to see that first lady Michelle Obama was wearing a dress that night designed by L'Wren Scott, his long-time girlfriend, who had a front-row seat for the concert. Jagger said he has never been invited to play at the White House before - or for any head of state - and he rated it a "surreal gig experience". "I loved it," he said. "It was really unusual, surreal, and strange, but very enjoyable ... I went out there and I tried to put out my best." Speaking about the possibility of the Rolling Stones reuniting this year for a 50th anniversary tour, he said: "I hope we certainly do something. It would be very appropriate, I think, and I look forward to doing something. But nothing is yet booked." 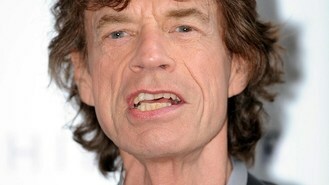 Jagger and other blues greats played the East Room on Tuesday as part of an In Performance at the White House concert.